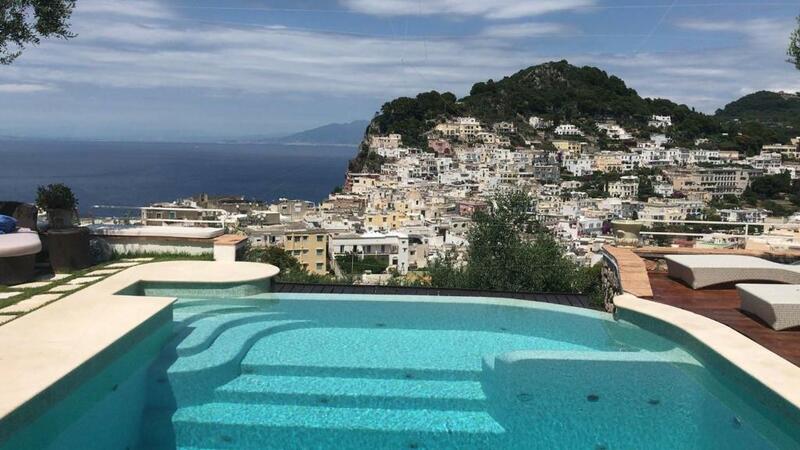 Set on Capri island, Villa Panorama features an outdoor pool with panoramic views of the Gulf of Naples. This accommodations is surrounded by a 1.5-hectare park and offers free WiFi and a furnished patio with BBQ facilities. With air conditioning, this spacious villa includes satellite flat-screen TV, a washing machine, and a fully equipped kitchen with dishwasher. It also comes with 4 bathrooms. The popular Piazzetta square is just 1,300 feet from Villa Panorama. The Marina Grande ferry harbor can be reached in 5 minutes by car. Villa Panorama, an exclusive villa is furnished with items of value and elegance. 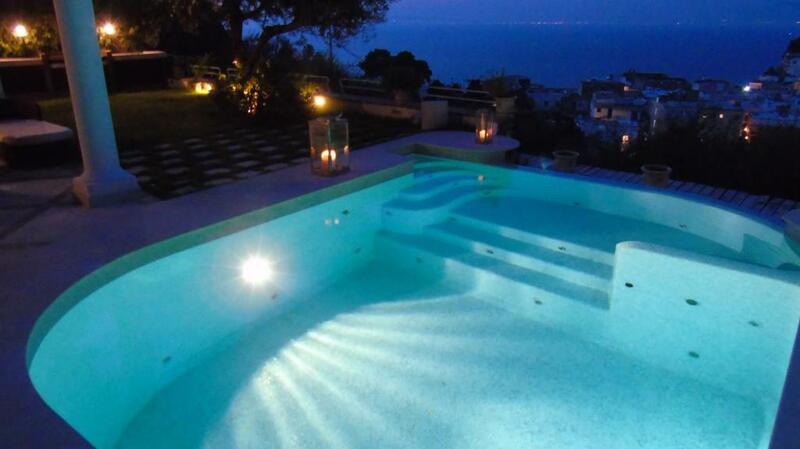 The charming Villa is composed of a main building of 140 square meters. distributed on two levels and a dependance of about 60 sqm. separated from the main house by a long flight of steps, but perfectly illuminated running through the various terraces, where there is also a beautiful lemon. In the main villa on the ground floor we have a double room with direct access to the patio area with table, chairs and sofas; an adjacent bathroom and a beautiful fully equipped kitchen, also with direct access to the patio. A master bedroom with en-suite bathroom and access to the patio. Upstairs we have a master bedroom with en-suite bathroom. 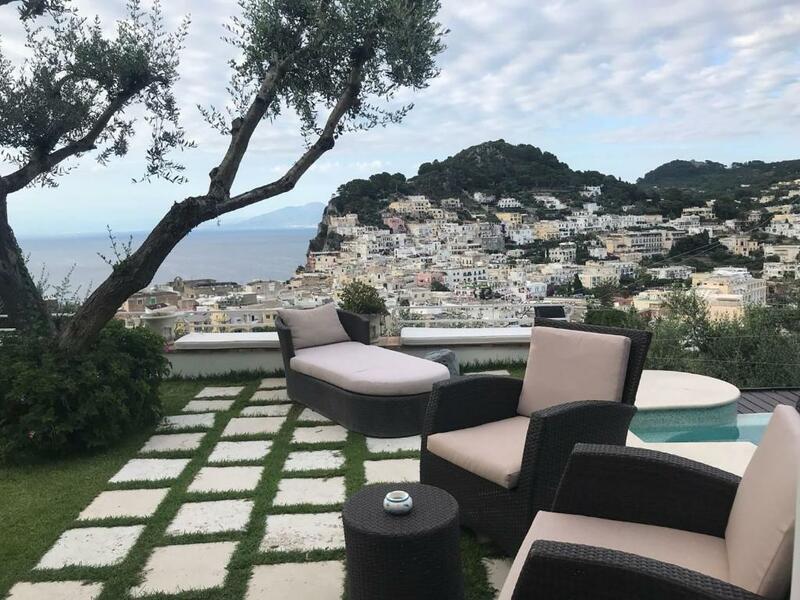 The room leads to a terrace from which you can admire a wonderful view of Capri and the Bay of Naples. This room has a separate entrance which is accessed by a large garden. Outside there is a large barbecue area with kitchen, livin The Annex is composed of a living room and two double bedrooms each with en-suite bathroom. The rooms have direct access to an outdoor area. Access to the Annex is both from the main Villa through a staircase, and directly from Via Castello. This Annex can be rented together with the main villa if the number of guests is greater than 4. The whole Villa including the Annex is 'ideal for families with older children and / or groups of friends of 6/8 persons. The scenario within which Villa Panorama articulates is Capri and the marvelous view of the Gulf of Naples. 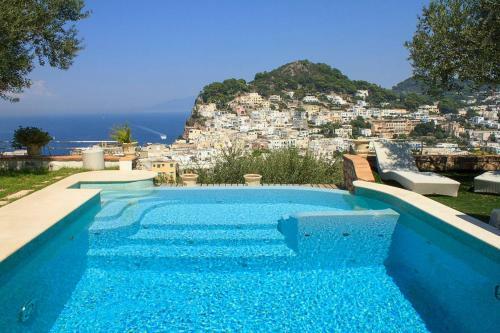 The Villa is located in the center of Capri, just a 10 minute walk from the Piazzetta. If you arrive by taxi you can be accessed from Via driveway and then walk for about 3 minutes. From the port of Marina Grande you arrive by car in 10 minutes. A EUR1000 damage deposit is required on arrival (around USD1120.25). This deposit will be fully refunded 7 days after check-out, as long as there isn't any damage to the property. Electricity up to 250 kW/h per week is included. Any further consumption is charged EUR 0.40 per kW/h. Guests can request extra cleaning service at an additional cost of EUR 15 per hour and extra linen change at EUR 10 per person. A damage deposit of EUR 1000 is required on arrival. That's about 1120.25USD. This will be collected by credit card. You should be reimbursed within 7 days of check-out. Your deposit will be refunded in full by credit card, subject to an inspection of the property. We need at least 5 reviews before we can calculate a review score. If you book and review your stay, you can help Villa Panorama meet this goal.